For thousands of users around the world, density measurement means DMA™ 4500 M. These density meters are in use day in, day out, wherever reliable and accurate 5-digit density values are required. To achieve this, the patented Repeated Fade-out Method applied by DMA™ 4500 M delivers the most stable density results based on comprehensive knowledge of the oscillation characteristics. This method results in viscosity correction which is twice as effective as anything else available on the market. The automatic bubble detection system gives you back control of your filling. With this unique method you also benefit from built-in intelligence: frequently changing users with differing filling approaches, humidity, air pressure, and instrument condition, all these have no effect on the operation and results. We have a new DMA 4500 M and we are trying to have the data sent to our computer, we have hooked up the transponder to the DMA. We have gone through the settings menu and read the manuals, we can not find any information on what we are trying to do. 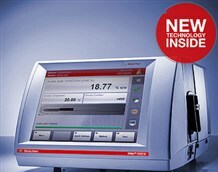 There are no threads in Anton Paar DMA™ 4500 M density meter Reviews at this time.